With Valentine’s Day now just 2 weeks away my thoughts have been turning to how to mark the occasion. I’m not a huge fan of overly commercialised days. Instead my husband and I try to make time for each other through the month, rather than go all out on one day each year. We’re huge Netflix fans round here. Lack of a baby sitter means we often watch a film when the children have gone to bed. Sometimes it’s good to plan something which doesn’t revolve around a screen though, so I thought I’d share 5 creative date night ideas for busy parents which don’t involve a screen. My husband and I love to bake together. We split the normal cooking but it is so lovely to plan to make something which caught your eye on Pinterest or a food magazine. I’m always tearing recipes out and sticking them on the kitchen cupboard to remind me to make them. This is a great way of trying something new together and of course creating something delicious to enjoy. As well as baking we love to craft. Our skills seem to compliment each other really well and when we work together we can produce great additions to our home. Some of my favourite projects include furniture we have re-upholstered, our wooden pallet mud kitchen for the garden, and our festive upcycled sign. I love creating things for the family, and it definitely makes me feel good to know that we given furniture a new lease of life. Most of our DIY projects have taken a few evenings but they add value to our home and make me smile every time I see them. I’ve always been a huge fan of board games. Every Friday we have Games Night where we take it in turns to pick a board game for the whole family to enjoy. There’s no reason why you can’t do this as an adults only thing too though! Our current favourite is Ticket to Ride. have you heard of it? It’s a railway-themed German-style board game designed by Alan R.Moon. We play the Ticket to Ride 1910 USA version which is fun. It’s a good strategic game and highly addictive. Planning a holiday might not seem very romantic but we love having something to look forward to as a family. Sometimes it can be difficult to make time to plan holidays but it’s never wasted time. We recently booked a week in an amazing cottage by the sea for the Easter holidays. The children were so excited when we told them and it definitely makes the winter days fly by. I love cooking but sometimes it’s nice to share a takeaway together. I love trying a new cuisine and not being stuck in the kitchen means more time to talk! I also love it when my husband picks up a sweet treat from our favourite bakery on his way home from work. Trying something new together. It’s not often we have a babysitter but on the few occasions we’ve managed it we’ve been able to try some fun experiences. The cupcake decorating class we tried paid dividends thanks to the new skills we picked up. We also tried wine tasting which was really fun. There are some brilliant workshops and courses that we would love to do together, ranging from terrarium making, book binding and screen printing. 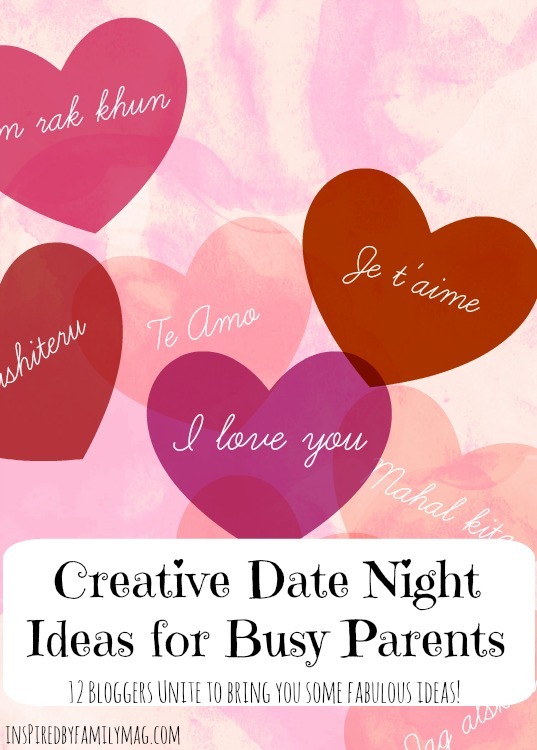 12 Creative Date Ideas for Busy Parents was created to inspire tired and busy moms to be intentional and carve out one on one time with your spouse. Come back and check out all of the great ideas these awesome bloggers are sharing. You can find an updated schedule over at Inspired by Family.